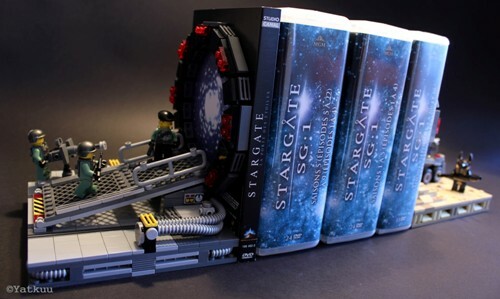 Stargate is an all time favorite for Sci-Fi fans. It all started with the title movie in 1994, it was later followed by several TV shows, the principal one being Stargate SG-1 which ran for 10 seasons and a whopping 214 episodes. 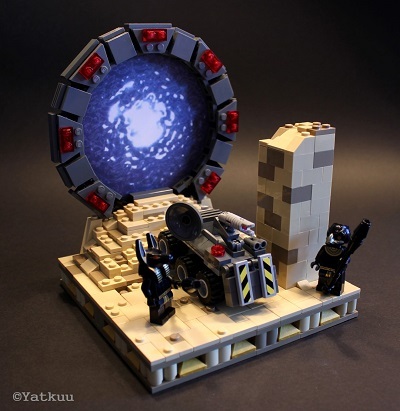 This MOC depicts the earth gate located in the SGC (Stargate Command) and the Abydos gate, each vignette is built on a 16*16 studs base. The 2 vignettes can either be connected to the other to form a larger diorama or used as bookends - or rather “dvd ends” as shown here. The vortex effect is achieved with a simple printed sheet of paper. 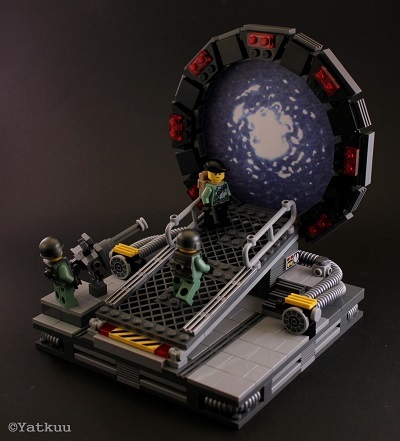 The instructions and parts list do not include the Minifigs, for the SGC soldiers you can use a number of "military" looking Figs or custom ones with 3rd party weapons. For the Jaffas (these are the aliens with the Egyptian god masks) I used an Anubis guard from the Pharao's Quest theme and a Raven soldier from the Legends of Chima theme.